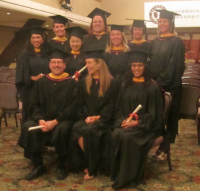 On August 14, 2012 Saybrook University’s College of Mind-Body Medicine held its first independent graduation ceremony as a College! The Commencement Ceremony took place in San Diego, California. University Provost Dan Sewell, College Dean James Gordon, and College Chair Donald Moss bestowed the master’s degree in mind-body medicine on fourteen individuals. Ten of the 14 graduates were present for the ceremony, and are pictured in the accompanying photo. 14. Heidi Marie Tobin, “Equine-Assisted Therapy as an Adjunct Treatment in Essential Hypertension,” (Donald Moss, PhD, Chair). Each of these individual master’s projects or theses have been or will soon be covered in a separate College of MBM blog entry. The entire faculty and the College leadership wish a heartfelt congratulations to the fourteen new graduates.